Royal Family Kids Camp, oh how much fun we had with 262 children! So many new children, new volunteers, and new memories were made for all. We were definitely blessed with the new children by seeing their excitement over everything we did and once again seeing how our God worked through us to make the week of camp very special for everyone at camp. We had a new volunteer who found us after seeing the film CAMP and he attended both camps. We had volunteers who were out of work but not out of service for the Lord. And we had many volunteers returning who have served faithfully for 10-15 years. It was so AWESOME! To our volunteers we say thank you for your sacrifice in giving a week of your life to these precious children. Counselor Marcus’s campers were fighting in the pool. It seems there was on surf board between the two boys. “Who brought this surf board?” Neither boy spoke up. “Alright, who had it first?” Both boys shouted, “I did, I did.” “Alright, put out your hands. Now I’m going to hit your hand really hard. If you are telling the truth, it won’t hurt at all. But if you are lying, it is really going to hurt.” One hand pulled back immediately. Marcus turned to the other camper, handed him the surf board and said, “Thank you for telling the truth.” Solomon has nothing on Marcus! Serving as a camp counselor for kids would not have gotten on Harry’s very full calendar last year at this time. Harry is a self-proclaimed over achiever. He has several degrees in engineering and business, and has a very successful career. Only things that served to advance his career made his calendar. But God had been pursuing Harry. When Harry’s personal life began to get rocky, God provided Danny as a coworker. Harry had hired Danny several months earlier to work as a technical writer on his team at Bell Helicopter. Danny always came to work happy which bugged but also intrigued Harry. Harry’s life had been on a downhill slope for some time. So when Danny asked him to the men’s retreat at his church, Harry accepted sensing that the retreat might be what he needed to change the direction of his life. At the retreat, three things impacted Harry – the speaker, the Royal Family booth, and an invitation to Quest, a week long intense Bible study. As Harry began taking steps toward Jesus, the focus of his life began to change. The self-consumed life was no longer attractive. Harry realized he no longer wanted to go through life without giving back. Since that men’s retreat, Harry has changed to focus of his life from himself to Jesus and others. In the last six months, Harry has participated in Habitat for Humanity, Special Olympics and now RFKC. His coworkers have noticed the change. They have been impressed, and also surprised that Harry would take a week vacation to work with kids. But Harry is different. God got his attention and his calendar proves it. Melody liked to have her girls journal and pray during their quiet time. One night before bed they were praying about their dreams. Both girls wanted to have homes with enough rooms for everybody and a table big enough to feed the hungry. But these girls still took the time to ask what Melody’s dreams were so they could pray for her. 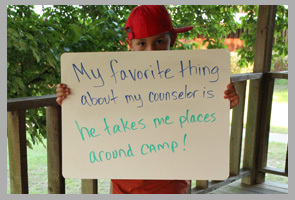 To learn more about Royal Family Kids Camp, click here.